The US ambassador to Nigeria has revealed that The United States recently made a decision to sell Nigeria a host of weapons, bombs and 12 Super Tucano A-29 planes. The sales had been delayed by Barrack Obama Former U.S. President, in response to the Nigerian Air Force bombing a refugee camp in January. The new US President Mr. Donald Trump in a bid to help Nigeria’s efforts to eradicate Boko Haram and bolster US defence jobs has decided to continue the transaction. There has been no immediate statement from authorities in Washington or the U.S. embassy. 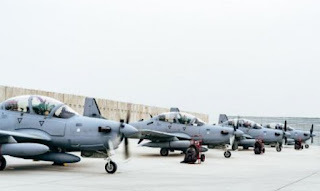 However Nigerian Air Force officials and US government officials are to meet in January to discuss payments and the express delivery of the airplanes if terms are met. “The sale of the 12 aircraft, with weapons and services, is worth $593 million, and includes thousands of bombs and rockets. The propeller-driven plane with reconnaissance, surveillance and attack capabilities, is made by Brazil’s Embraer. A second production line is in Florida, in a partnership between Embraer and privately held Sierra Nevada Corp of Sparks, Nevada. The Super Tucano costs more than $10 million each and the price can go much higher depending on the configuration. It is powered by a Pratt & Whitney Canada PT 6 engine” The Nigerian Airforce have said.